The Street of a Thousand Blossoms, a novel by Gail Tsukiyama, follows the lives of two ordinary boys growing up in Tokyo, their hopes and dreams and their experiences from 1939 through war in the 1940s and new lives in the modern Japan of the 1960s. Tsukiyama tries to portray the lives of the ordinary Japanese and how they might have been affected by the war. The two brothers have different goals - Hiroshi dreams of becoming a famous sumo wrestler and Kenji learns to hand craft masks used in Noh theater. Their lives are changed and affected by the war thought they are not an integral part of it. A novel from a Japanese-American author who has written five other novels including Women of the Silk and The Samurai's Garden. Red Mandarin Dress: An Inspector Chen Novel (Inspector Chen Cao) In the fifth mystery in the series by Qiu Xiaolong, Chief Inspector Chen Cao of the Shanghai Police Bureau reluctantly puts aside his studies of classical Chinese literature to help solve the sensational Red Mandarin Dress murders. Three young women have been found in public locations in the city, each dressed in a torn red mandarin dress. Inspector Chen and police officer Yu race against time to solve their murders before the serial killer can find another victim. Chen and Yu visit libraries and interview expert tailors and people knowledgeable about the old style mandarin dresses. They link the dresses back to the period of the Cultural Revolution. Using the information he gathers, Chen uses modern psychology to create a profile of the killer, at the same time as he analyses each situation with relevant quotes from Tang and Sung poetry and sayings from the sage Confucius. I enjoyed reading about the detailed police procedures used to solve the crime in modern day Shanghai. I also found interesting the author's distaste for some aspects of the past, namely the Cultural Revolution and its lingering effects, and the "cruel" cuisine that is still practised by some cooks and demanded by patrons. How we came to be where we are, health care in Canada and the U.S.
Just finished writing a review of Twilight, a futuristic thriller by Brendan DuBois, about the UN occupation of America after civil war breaks out as a result of nuclear attacks on America's major cities. 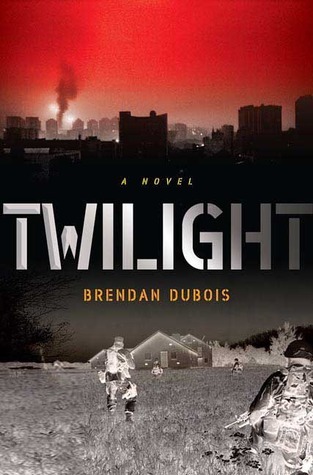 The novel creates a Sarajevo in the U.S., with militant groups at war with the government to control the country and the scarce food and fuel. A thriller that is none too pleasant to read, but interesting nevertheless. Picture yourself in Sarajevo, the capital of Bosnia, around the early 1990s, after the break-up of Yugoslavia into separate entities, when Bosnian Serbs fought with Bosnian Muslims and Bosnian Croats for supremacy and for territory in Bosnia-Herzegovina. Picture the genocide or “ethnic cleansing” that resulted when Serbs tried to rid the land of Bosnian Muslims. Envisioning this scenario will put you right smack in the middle of the thriller, Twilight. We view the situation in the U.S. through the eyes of Samuel Simpson, a young Canadian photographer who has joined the UN organization trying to keep the peace in the embattled country. He is with UNFORUS and with a group of people whose goal is to find Site A, proof of genocide committed by the militia which will serve to convict U.S. war criminals being held in The Hague. There is a time limit, as the criminals will be released if Site A and proof of mass murder is not found in time. Samuel and his group have to tread carefully through dangerous situations involving the militia, who have murdered civilians as well as UN personnel. There is definitely a lot of intrigue built into the plot of this novel, as the UN group literally treads on ground they have not seen before, in situations that are unpredictable and frightening. Written with gripping detail and description of countryside, surroundings, and events, the book presents a challenging situation that is gloomy in its forecast. There is little sense of poignancy in the book, except for an old man who puts his life at risk to help the UN group. The attempt at a love story between Samuel and team member essentially falls flat, thought it is meant to be a saving grace for Samuel in the middle of the turmoil. We are not caught up in his feelings. Indeed, his love interest is not a well developed character. A good thriller, but don’t expect to be fully satisfied at the end of the book. The yucca plant common to the Southwest USA is also known as Spanish Dagger because of its sharp narrow leaves, pointed at the tips. 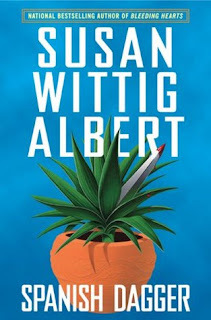 Spanish Dagger, a mystery novel by Susan Wittig Albert, sets its murder victim right in the middle of a patch of yucca. The body of a man is found by herbalist China Bayles while she was out gathering leaves of the yucca plant for a papermaking class. Tequila is made from the blue yukka (agave), sorry, I mean yucca, and has the same healing properties as the fresh plant. So no problem with those margaritas! Juice from the Yucca plant is also good for lathering your hair and bathing. Anyway, if you like your mysteries spiced with herbal lore, here is a book for you.